Counter rotation on left hand deck: Spreads grass clippings more evenly. Wing decks throw grass away from the rear deck. Rear deck doesn’t get covered up nor does it get bogged down by cut grass. 6" Deck overlap: Eliminates blade skips when turning. Tighter turns can be made. Allows for maximum amount of wing deck flex. Sleek frame design, including single beam hitch and compact deck overlap: Design allows operator to make tighter turns without leaving windrows and skips. The AFM virtually becomes a zero turn mower. Automatic transport wing locks: When wings are raised in the full transport position, the wings lock in place, no need to get off the tractor to lock. Pull rope from tractor seat to unlock. 23" Transport tires with tapered bearings: 23" Transport tires offer smooth roading and less grass compaction. Allows grass to stand up. Tapered roller bearings offer longevity. Removable transportation tire spindles: Allows a spindle to be replaced by simply removing two bolts. Back wheels on side decks even with transportation tires: Allows tighter turns without skips. Rigid rear side deck tires: Rigid wheel yokes holds hills and slopes better. Safer unit than the competition. Large deck flotation tires with sealant: Optional 15" tires for great flotation or 18" tires for even greater flotation. The larger the tire the less compaction in pounds per square inch allowing grass to stand up. Sealant in the tires minimizes flats. 1/4" Gauge wheel arms: Gives the mower gauge wheel arms a great deal of “hidden” strength. Low pivot points on deck: The lower the pivot points are to the ground, the more side to side swing, allowing for excellent flotation from each deck. Deflectors built into mower decks: Safety features meet ANSI standards. Many competitors use chains for protection. Once chains are removed the unit may not meet ANSI specifications. Rear discharge: Even dispersal, discharged items are always aimed downward. No rear chains are needed, which tend to clump damp grass. Cat. 4 CV main driveline: Constant velocity main driveline allows for tighter turns without harming U-joints in driveline, includes slip clutch. Slip clutch protection: Guards against premature gearbox failure. Protects mower deck spindles. Cat. 2 wing drivelines: Reduces start-up torque that is put on the driveline, gearbox and gearbox support. 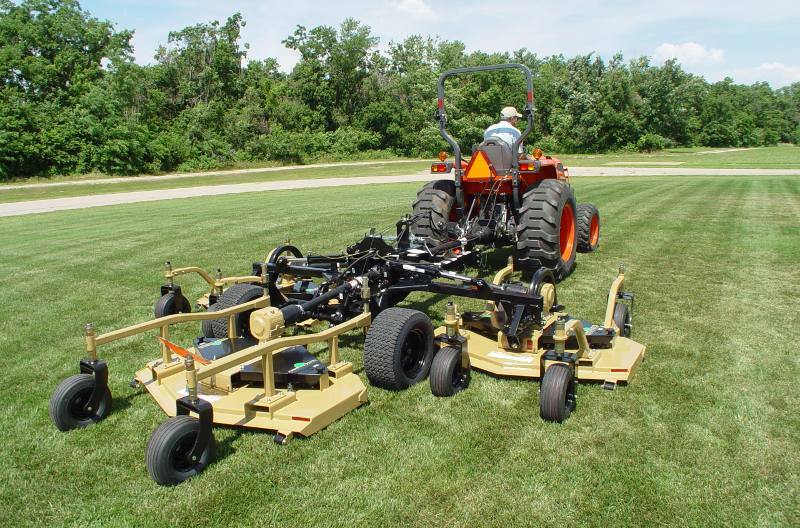 Heavy gearbox mounts on center and side mower decks: Handles start up torque. Easy to grease blade spindles: No guards to remove for routine greasing of blade spindles. Middle spindle sits towards the back of the mower deck: Uses less horsepower and allows material to escape the mower deck easier. The discharge of material is more even. Design eliminates windrowing. Spring loaded idlers: Applies constant tension to belt to run efficiently. Easy belt tension release: Easily release belt tension for changing belt or for winter storage. High blade tip speed: Lifts grass up for a clean cut and efficient discharge of material. Tip rates as high or higher than the competition. Low Lift: Highly recommended in sandy soils where lifting isn’t crucial. Disturbs the soil very little, allowing blades to wear longer. Medium Lift: Medium suction for lifting grass. Requires less HP than high lift. High Lift: Greatest suction for lifting grass before cutting. Can take higher HP in tall dense grass. Not recommended in sandy soils. Mulching: Perfect for leaf mulching. Optional Hydraulic Operated Transport Locks: Transport locks can be released easily from the tractor seat while operating the same tractor control lever that raises and lowers the mower decks. Eliminates pulling a rope to release transport locks. LED Signal lights: LED lights are bright, long lasting, and resistant to vibration, unlike incandescent counterparts. Optional Hydraulic Operated Transport Locks: Transports locks can be released easily from the tractor seat while operating the same tractor control lever that raises and lowers the mower decks. Eliminates pulling a rope to release transport locks. Cutting Width: 14 ft.-0 in. Overall Width: 14 ft.-3 in. Transport Height: 7 ft.-7 1/2 in. Transport Width: 6 ft. - 8 in. Machine Weight: W/15 in. tires = 3,000 lbs. ; W/18 in. tires = 3,150 lbs. Deck Size & Quantity: 3 each / 60 in. Blade Spindle Speed: 3,362 R.P.M. Blade Tip Speed: 18,396 F.P.M. Mowing: 14 ft. 10 in. ; Transport: 12 ft. 11 in.